At the outset, please allow me to join other distinguished delegations in thanking H.E. Deputy Minister Araz Azimov for his comprehensive address which provided a good overview of the efforts and achievements made by Azerbaijan in recent years including in the areas of economic development and regional cooperation. I wish to seize this opportunity to highlight that we greatly value the excellent relations and co-operation that exist between our two countries. Since 2002, numerous high-level meetings between Afghanistan and Azerbaijan, including at the heads of state level have taken place, which can be exemplified by the recent visit of H.E. President Mohammad Ashraf Ghani to Baku, in December 2015. We also enjoy fruitful inter-parliamentary relations which will hopefully further grow in the future. Furthermore, troops from Azerbaijan joined ISAF in 2002 and today, Azerbaijan is contributing to the Resolute Support Mission, for which we are grateful. We appreciate the generous support from Azerbaijan in terms of the provision of education and training opportunities including for our law enforcement officers and medical personnel. We also appreciate investments made by Azerbaijan, in particular in Afghanistan’s infrastructure. There is also good dynamics in terms of our bilateral trade turnover. We believe that increased economic ties will complement our long-standing political relations. We see a number of important transit opportunities between Afghanistan, Turkmenistan, Azerbaijan, Georgia and Turkey including the Lapis-Lazuli-Corridor as one of the shortest and cheapest transit routes in the region. 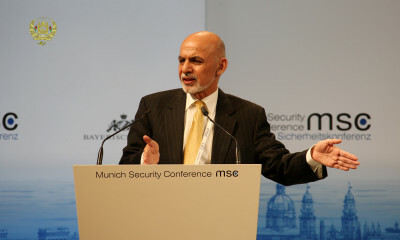 It is our goal to turn Afghanistan into a regional land-bridge and a hub for regional energy cooperation and in doing so we are trying to share the benefits of our centrality, including through RECCA and the Heart of Asia Process, with countries in the region and beyond, with a view towards enhancing trade and development at both regional and continental levels. In closing, let me state that we are confident that both our bilateral co-operation as well as our collaboration in multilateral settings – including under the OSCE – will be further strengthened. H.E. Minister of Foreign Affairs, Salahuddin Rabbani, met this afternoon at the Ministry of Foreign Affairs with the Ambassadors of Britain, Bulgaria, Czech Republic, Denmark, Finland, France, Germany, Italy, Netherlands, Spain and Sweden; the Chargé d’Affaires of Norway; and the Deputy Representative of the European Union and the representative of the European Union Police in Afghanistan. han government and the Taliban, Minister Rabbani added that based on the decision of (QCG), it is expected that by the end of February this year the date for direct talks will be determined and announced. Minister Rabbani also added that the Afghan government is seeking support from European countries towards implementing its programs to stop migrants and pave the ground for those who wish to return voluntarily to the country.